To add constants, tap the menu button, the three lines in the top left-hand corner of your window and tap Constants under "Library." Enter a constant using the fields shown below by adding its name, subscript and expression. Tap save to use it in the future. 1) Constant name - enter a name for your constant (limited to one character). 2) Subscript (optional) - you can refer to constants with a subscript by including the subscript in brackets following the constant's name, e).g. a[b]. 3) Enter the constant expression. 4) Tap SAVE to save the new constant to the library. 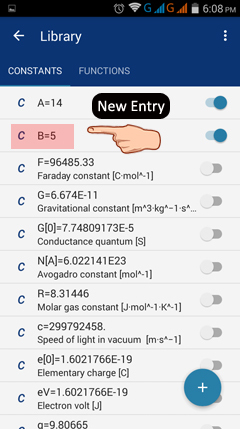 5) Tap X button in the top left-hand corner to return to the constants list. 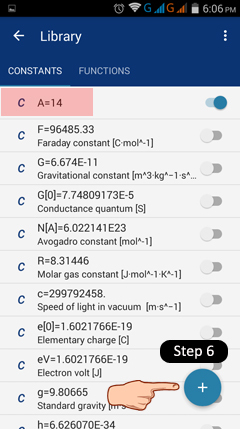 6) Tap the + sign in the bottom right of the constants list to add another constant. The new constant will appear in the list along with its assigned expression. Tap the entry if you want to edit it. 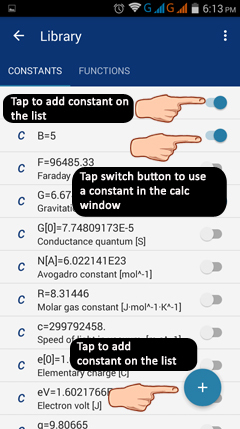 Tap the + button to add new constants to the list. 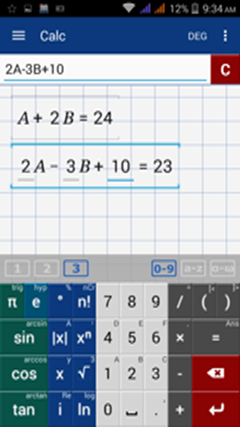 Tap the back button of your phone to switch back to the calculator window or use the back button at the top next to "Library." You may now use your new constant in calculations. 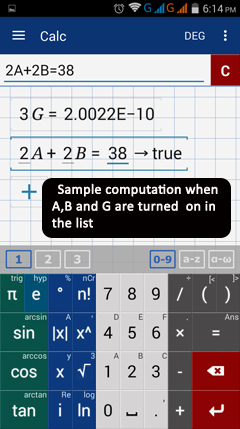 All calculations using the constant's name will automatically be evaluated at the given value saved in the library. 1) Tap the three lines in the top left-hand corner to open the Menu. 2) Under "Library", tap Constants. 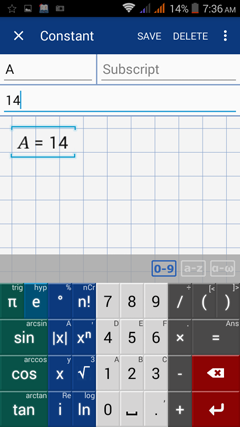 3) Tap the "on-off" button (located to the right of the constant's name and value) to switch it on. 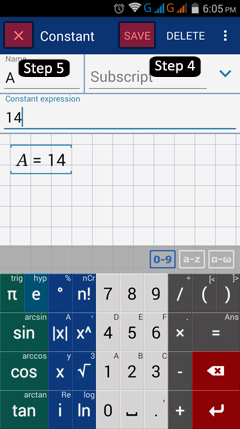 Switching it on allows you to use the constant in the Calc window. 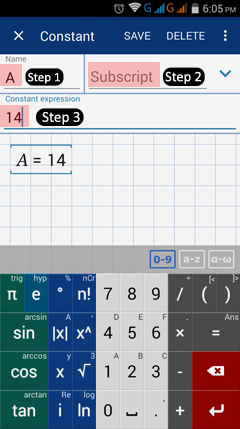 4) Tap the button again if you no longer want to use the constant in your calculations.